The French Revolution (1789–1799) was a period of ideological, political and social upheaval in the political history of France and Europe as a whole, during which the French polity, previously an absolute monarchy with feudal privileges for the aristocracy and Catholic clergy, underwent radical change to forms based on Enlightenment principles of republicanism, citizenship, and rights. These changes were accompanied by violent turmoil, including executions and repression during the Reign of Terror, and warfare involving every other major European power. The Revolution was originally a popular uprising against the absolute power of the king and against the privileges and wealth of the elite, and was perpetrated in the name of liberty, equality and fraternity. In reality it led to the loss of liberty, dictatorship and nationalism. The revolution was based on a hatred of tradition and desire to use the power of the state to create a new order. People were given new identities as citizens of the state. To crush the resistance to revolution and the new order about 18,000 - 40,000 people were executed. The revolution was unable to establish a durable system of governance, and in the following century, France would be governed variously as a republic, a dictatorship, a constitutional monarchy, and two different empires and under a dozen different constitutions. 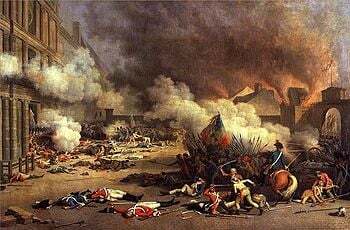 Subsequent events caused by the revolution include the Napoleonic wars, the restoration of the monarchy, and two additional revolutions as modern France took shape. The longer term European consequences include the counter-enlightenment and romantic movement in Germany which arose in reaction to the imposition of French rationalist culture. This was accompanied by the reunification of Germany as a defensive measure against a future Napoleon. French revolutionary ideas also inspired and influenced Marxist revolutionary movements such as the Bolsheviks in Russia who followed the pattern established in France of large scale executions of the enemies of the people by impersonal government organs. In France, not everyone sympathized with or supported the Revolution and no single, dominant or shared vision of governance developed. There were too many monarchists to have a republic and too many republicans to have a monarch. What the Revolution did emphasize was the concepts of being a citizen with rights and of that nation as belonging to its citizens, who are not merely subjects of a ruler who more or less “owns” the state. The French revolution put nationalism on the political map. 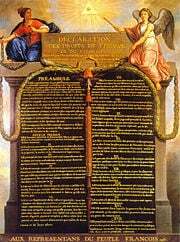 The Ideals: Declaration of Human Rights The concept that the people of a nation are citizens with rights was a fundamental assumption of the French Revolution. Historians disagree about the political and socioeconomic nature of the Revolution. Under one interpretation, the old aristocratic order of the Ancien Régime succumbed to an alliance of the rising bourgeoisie, aggrieved peasants, and urban wage-earners. Another interpretation asserts that the Revolution resulted when various aristocratic and bourgeois reform movements spun out of control. According to this model, these movements coincided with popular movements of the new wage-earning classes and the provincial peasantry, but any alliance between classes was contingent and incidental. The social and psychological burdens of the many wars of the eighteenth century, which in the era before the dawn of nationalism were exclusively the province of the monarchy. The social burdens caused by war included the huge war debt, made worse by the monarchy's military failures and ineptitude, and the lack of social services for war veterans. A poor economic situation and an unmanageable national debt, both caused and exacerbated by the burden of a grossly inequitable system of taxation. The Roman Catholic Church, the largest landowner in the country, which levied a harsh tax on crops known as the dîme. While the dîme lessened the severity of the monarchy's tax increases, it nonetheless served to worsen the plight of the poorest who faced a daily struggle with malnutrition. The continued conspicuous consumption of the noble class, especially the court of Louis XVI and Marie-Antoinette at Versailles, despite the financial burden on the populace. Widespread famine and malnutrition, which increased the likelihood of disease and death, and intentional starvation in the most destitute segments of the population during the months immediately before the Revolution. The famine extended even to other parts of Europe, and was not helped by a poor transportation infrastructure for bulk foods. (Some researchers have also attributed the widespread famine to an El Niño effect.). Hatred toward the King for firing Jacques Necker and Anne Robert Jacques Turgot, Baron de Laune (among other financial advisers) who represented and fought for the people. Finally, perhaps above all, was the almost total failure of Louis XVI and his advisers to deal effectively with any of the problems listed above. The causes listed above did not determine the course and outcome of the revolution. What affected the decisions that were made were the assumptions and ideals of the participants. The revolution—and the course that it took—was affected by the ideas of the French Enlightenment. Pre-revolutionary France was a complicated and very illogical place without common laws or institutions of government. In theory the king was the source of all law and administrative authority reigning by the grace of God. In practice he was hemmed in by a multiplicity of customs and interests which made it almost impossible to change anything. For years intellectuals had been discussing how to change and regenerate French society but they did not have the power to make much difference as all power was in the hands of the nobility. They had little practical experience of government. This tended to make their discussions even more abstract and idealistic. Unlike England, in France there was no national or even regular local parlements where ideas and policies could be debated and reforming laws passed and implemented. The pre-eminent French philosopher was Descartes. He extolled reason as the criterion of truth and rationality as the standard by which everything was to be judged. Descartes was a brilliant mathematician whose inspiration came from Euclidean geometry which enabled complex structures to be built up from simple axioms. The nature of geometry is that there is only one right answer to a problem. All other answers are false. This is why Descartes thought that reason was independent and not a social construction. He and his successors believed that the social order, like geometrical order, was the product of design and could thus be redesigned by intelligent people. In this way human society could be made anew. This is why Abbé Sieyès exhorted the French Revolutionary Assembly to "act like men just emerging from the state of nature and coming together for the purpose of signing a social contract." The idea driving this movement was that it is possible and right to overthrow an existing order, by force if necessary, on the grounds of abstract principles rather than existing laws. Tradition and custom had no authority. This was quite different from the English and American rebellions which sought to make government respect the law, especially the old ones. Descartes was not attracted by the messiness of Athenian democracy but instead took Sparta as his model. He said her greatness "was due not to the pre-eminence of each of its laws in particular… but to the circumstance that, originated by a single individual, they all tended to a single end." The goal was not to create a society based on laws which secured people's freedom to pursue their own legitimate purposes. Instead it was to create a society where everyone followed the purposes determined by the ruler. Sparta was also the ideal of Jean-Jacques Rousseau, Robespierre, and Saint Just. This widely accepted assumption made establishing and accepting dictatorial rule very likely. Rousseau was the most influential political philosopher in France. He believed that human beings were born sinless but were corrupted by society. This was in contrast to the traditional Christian view that people are born selfish and need to be socialized into good behavior by the family and other social institutions. Rousseau thought that all that is required for people to realize their full human potential was to change the social conditions. The agent to achieve this perfection is government. To begin this process, everyone in the society has to subscribe to a new social contract. In order to be free, every individual has to surrender his rights to a collective body and obey the general will. The state is vested with total power, which is legitimate because it has the consent of the majority. The general will, by definition, is always right and reflects the real interests of every member of society. So anyone who disagrees with the general will is mistaken and acting contrary to his own best interests. It is the ruler's responsibility to correct him and force him to act for his own benefit, to force him to be free. What is supremely important is the whole, of which an individual is merely an expendable a part. Since the French monarchy had already centralized all power in itself, as epitomized by the statement of Louis XIV "L’État c’est Moi," all that needed to happen was to seize that power and use it for the benefit of society, to make people free. Again this was quite different to the Anglo-American attempt to secure freedom by limiting the power of the state and decentralizing power as much as possible. The irony is that despite the fact that the most intelligent people were involved in the French revolution at every stage, there actually was no plan nor anyone capable of making one. Instead once the initial steps had been taken, the internal logic of the train of events that had been set in motion unfolded. An astute observer of human nature and affairs like Edmund Burke was able to predict what would follow with uncanny accuracy. Another important element in French political culture was its anti-clericalism. France was a Catholic country and the church was immensely powerful. It had a monopoly of public worship and Protestants had no civil rights. It controlled the educational system, poor relief, hospital provision, and had extensive powers of censorship. The pulpit was used by the secular authorities for announcements and keeping the king's subjects docile and obedient. There developed a strong anti-clerical reaction to the intolerance and obscurantism of the church. Voltaire (1694 – 1778) traveled to England during the height of the deist movement and brought back to France many new ideas from the free thinkers he met. Although many Englishmen adopted certain deist ideas that were compatible with a free Christianity, in France they were accepted as reinforcing the anti-clericalism of the age. The Jesuits who carried the intellectual weight of the Church had been suppressed by Louis XV, and so the radical deist ideas encountered little opposition. Voltaire disseminated these ideas to become the leading satirist of the Catholic Church mocking it continually. His views were widely accepted among intellectuals. Traditional Christian values and virtues were rejected in favor of the supremacy of human reason. The Revolution's economic ideas were dominated by the Physiocrats, who preached the virtues of laissez-faire economic freedom. To achieve this they advocated a powerful interventionist role for government to sweep away the many obstacles to a natural economic order. These ideas, along with materialism and atheism, were disseminated by the Encyclopédie edited by Denis Diderot (1713 – 1784) and Jean le Rond d'Alembert (1717 – 1783) and affected the general tenor of society. This influenced the course of the revolution and its actions against the church. In its Jacobin phase, the revolution is best understood as an effort to establish citizenship as the dominant identity of every Frenchman-against the alternative identities of religion, estate, family and region. Citizenship was to replace religious faith and familial loyalty as the central motive of virtuous conduct. Indeed, citizenship, virtue, and public spirit were closely connected ideas, suggesting a rigorous commitment to political activity on behalf of the community-patria, not yet nation. In Jacobin ideology, citizenship was a universal office; everyone was to serve the community”. The immediate trigger for the Revolution was Louis XVI’s attempts to solve the government’s worsening financial situation. In February 1787, his finance minister, Loménie de Brienne, convened an Assembly of Notables, a group of nobles, clergy, bourgeoisie, and bureaucrats selected in order to bypass the parlements. Calonne asked this group to approve a new land tax that would, for the first time, include a tax on the property of nobles and clergy. The assembly did not approve the tax, instead demanding that Louis XVI call the Estates-General. On August 8, 1788, the King agreed to convene the Estates-General in May of 1789. By this time, Jacques Necker was in his second turn as finance minister. As part of the preparations for the Estates-General, cahiers de doléances (books of grievances) were drawn up across France, listing the complaints of each of the orders. This process helped to generate an expectation of reform of some kind. There was growing concern, however, that the government would attempt to gerrymander an assembly to its liking. In order to avoid this, the Parlement of Paris proclaimed that the Estates-General would have to meet according to the forms observed at its last meeting. Although it would appear that the magistrates were not specifically aware of the "forms of 1614" when they made this decision, this provoked an uproar. The 1614 Estates had consisted of equal numbers of representatives of each estate, and voting had been by order, with the First Estate (the clergy), the Second Estate (the nobility), and the Third Estate (middle class and peasants) each receiving one vote. Almost immediately the "Committee of Thirty," a body of liberal Parisians, began to agitate against voting by order, arguing for a doubling of the Third Estate and voting by headcount (as had already been done in various provincial assemblies, such as Grenoble). Necker agreed that the size of the Third Estate should be doubled, but the question of voting by headcount was left for the meeting of the Estates themselves. Fueled by these disputes, resentment between the elitists and the liberals began to grow. Pamphlets and works by liberal nobles and clergy, including the comte d'Antraigues and the Abbé Sieyès, argued the importance of the Third Estate. As Antraigues wrote, it was "the People, and the People is the foundation of the State; it is in fact the State itself." Sieyès' famous pamphlet Qu'est-ce que le tiers état? (What is the Third Estate? ), published in January 1789, took the argument a step further: "What is the Third Estate? Everything. What has it been up to now in the political order? Nothing. What does it demand? To become something herein." When the Estates-General convened in Versailles on May 5, 1789, lengthy speeches by Necker and Lamoignon, the keeper of the seals, did little to give guidance to the deputies, who were sent to separate meeting places to credential their members. The question of whether voting was ultimately to be by head or by order was again put aside for the moment, but the Third Estate now demanded that credentialing itself should take place as a group. Negotiations with the other two estates to achieve this, however, were unsuccessful, as a bare majority of the clergy and a large majority of the nobility continued to support voting by order. On June 10, 1789 Abbé Sieyès moved that the Third Estate, now meeting as the Communes (English: "Commons"), proceed with verification of its own powers and invite the other two estates to take part, but not to wait for them. They proceeded to do so two days later, completing the process on June 17. Then they voted a measure far more radical, declaring themselves the National Assembly, an assembly not of the Estates but of "the People." They invited the other orders to join them, but made it clear they intended to conduct the nation's affairs with or without them. In an attempt to keep control of the process and prevent the Assembly from convening, Louis XVI ordered the closure of the Salle des États where the Assembly met. Weather did not allow an outdoor meeting, so the Assembly moved their deliberations to a nearby indoor tennis court, where they proceeded to swear the Tennis Court Oath (June 20, 1789), under which they agreed not to separate until they had given France a constitution. A majority of the representatives of the clergy soon joined them, as did 47 members of the nobility. By June 27 the royal party had overtly given in, although the military began to arrive in large numbers around Paris and Versailles. Messages of support for the Assembly poured in from Paris and other French cities. On July 9 the Assembly reconstituted itself as the National Constituent Assembly. By this time, Necker had earned the enmity of many members of the French court for his support and guidance to the Third Estate. The queen, Marie Antoinette, the younger brother of Louis, the Comte d'Artois, and other conservative members of the king's privy council urged Louis to dismiss Necker. On July 11, after Necker suggested that the royal family live according to a budget to conserve funds, Louis fired Necker, and completely reconstructed the finance ministry at the same time. Many Parisians presumed Louis's actions to be the start of a royal coup by the conservatives and began open rebellion when they heard the news the next day. They were also afraid that arriving Royal soldiers had been summoned to shut down the National Constituent Assembly, which was meeting at Versailles, and the Assembly went into nonstop session to prevent eviction from their meeting place once again. Paris was soon consumed with riots, anarchy, and widespread looting. The mobs soon had the support of the French Guard, including arms and trained soldiers, because the royal leadership essentially abandoned the city. 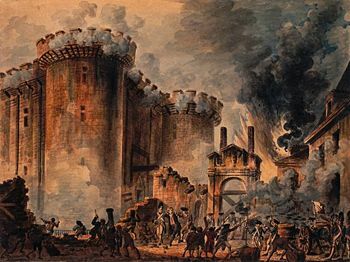 On July 14, the insurgents set their eyes on the large weapons and ammunition cache inside the Bastille fortress, which also served as a symbol of tyranny by the monarchy. After several hours of combat, the prison fell that afternoon. Despite ordering a cease fire, which prevented a mutual massacre, Governor Marquis Bernard de Launay was beaten, stabbed and decapitated; his head was placed on a pike and paraded about the city. Although the Parisians released only seven prisoners (four forgers, two noblemen kept for immoral behavior, and a murder suspect), the Bastille served as a potent symbol of everything hated under the Ancien Régime. Returning to the Hôtel de Ville (city hall), the mob accused the prévôt des marchands (roughly, mayor) Jacques de Flesselles of treachery; his assassination took place en route to an ostensible trial at the Palais Royal. The King and his military supporters backed down, at least for the time being. Lafayette - famous for also fighting in the American Revolutionary War - took up command of the National Guard at Paris. Jean-Sylvain Bailly, president of the Assembly at the time of the Tennis Court Oath, became the city's mayor under a new governmental structure known as the commune. The King visited Paris, where, on July 27 he accepted a tricolore cockade, as cries of Vive la Nation "Long live the Nation" changed to Vive le Roi "Long live the King." Necker was recalled to power, but his triumph was short-lived. An astute financier but a less astute politician, Necker overplayed his hand by demanding and obtaining a general amnesty, losing much of the people's favor. He also felt he could save France all by himself, despite having few ideas. Nobles were not assured by this apparent reconciliation of King and people. They began to flee the country as émigrés, some of whom began plotting civil war within the kingdom and agitating for a European coalition against France. 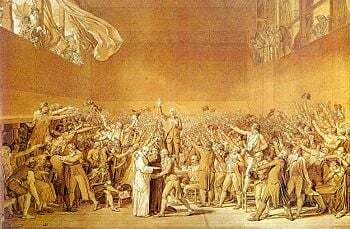 On August 4, 1789 the National Constituent Assembly abolished feudalism, in what is known as the August Decrees, sweeping away both the seigneurial rights of the Second Estate (aristocrats) and the tithes gathered by the First Estate (clergy). In the course of a few hours, nobles, clergy, towns, provinces, companies, and cities lost their special privileges. Looking to the Declaration of Independence of the United States for a model, on August 26, 1789, the Assembly published the Declaration of the Rights of Man and of the Citizen. Like the U.S. Declaration, it comprised a statement of principles rather than a constitution with legal effect. Necker, Mounier, Lally-Tollendal and others argued unsuccessfully for a senate, with members appointed by the crown on the nomination of the people. The bulk of the nobles argued for an aristocratic upper house elected by the nobles. The popular party carried the day: France would have a single, unicameral assembly. The King retained only a "suspensive veto"; he could delay the implementation of a law, but not block it absolutely. On October 5, 1789 the people of Paris, mainly working women, marched on Versailles in what was the Women's March on Versailles. The women were responding to their anger at the harsh economic situations they had to face such as bread shortages while the King and his court held banquets such as that for the royal guards on October 1, 1789. They were also demanding an end to Royalist efforts to block the National Assembly and for the King and his administration to move to Paris in hopes for the poverty to be addressed. On October 6, 1789, followed by 20,000 National Guards, the King and the royal family moved from Versailles to Paris thus legitimizing the National Assembly. The Assembly replaced the historic provinces with 83 départements, uniformly administered and approximately equal to one another in extent and population. Originally summoned to deal with a financial crisis, by late 1789, the Assembly had focused on other matters and only worsened the deficit. Honoré Mirabeau now led the move to address this matter, with the Assembly giving Necker complete financial dictatorship. The Revolution brought about a massive shifting of powers from the Roman Catholic Church to the state. Under the Ancien Régime, the Church had been the largest landowner in the country. Legislation enacted in 1790 abolished the Church's authority to levy a tax on crops known as the dîme, cancelled special privileges for the clergy, and confiscated Church property. To no small extent, the Assembly addressed the financial crisis by having the nation take over the property of the Church (while taking on the Church's expenses), through the law of December 2, 1789. In order to rapidly monetize such an enormous amount of property, the government introduced a new paper currency, assignats, backed by the confiscated church lands. Further legislation on 13 February 1790 abolished monastic vows. The Civil Constitution of the Clergy, passed on July 12, 1790 (although not signed by the King until December 26, 1790), turned the remaining clergy into employees of the State and required that they take an oath of loyalty to the constitution. The Civil Constitution of the Clergy also made the Catholic church an arm of the secular state. In response to this legislation, the archbishop of Aix and the bishop of Clermont led a walkout of clergy from the National Constituent Assembly. The pope never accepted the new arrangement, and it led to a schism between those clergy who swore the required oath and accepted the new arrangement ("jurors" or "constitutional clergy") and the "non-jurors" or "refractory priests" who refused to do so. The ensuing years saw violent repression of the clergy, including the imprisonment and massacre of priests throughout France. The Concordat of 1801 between Napoleon and the Church ended the dechristianisation period and established the rules for a relationship between the Catholic Church and the French State that lasted until it was abrogated by the Third Republic via the separation of church and state on December 11, 1905. Satirical cartoon lampooning the excesses of the Revolution as seen from abroad. Factions within the Assembly began to clarify. The aristocrat Jacques Antoine Marie de Cazalès and the abbé Jean-Sifrein Maury led what would become known as the right wing, the opposition to revolution (this party sat on the right-hand side of the Assembly). The "Royalist democrats" or monarchiens, allied with Necker, inclined toward organizing France along lines similar to the British constitutional model; they included Jean Joseph Mounier, the Comte de Lally-Tollendal, the comte de Clermont-Tonnerre, and Pierre Victor Malouet, comte de Virieu. The "National Party," representing the centre or centre-left of the assembly, included Honoré Mirabeau, Lafayette, and Bailly; while Adrien Duport, Barnave and Alexandre Lameth represented somewhat more extreme views. Almost alone in his radicalism on the left was the Arras lawyer Maximilien Robespierre. Abbé Sieyès led in proposing legislation in this period and successfully forged consensus for some time between the political centre and the left. In Paris, various committees, the mayor, the assembly of representatives, and the individual districts each claimed authority independent of the others. The increasingly middle-class National Guard under Lafayette also slowly emerged as a power in its own right, as did other self-generated assemblies. The Assembly abolished the symbolic paraphernalia of the Ancien Régime, armorial bearings, liveries, etc., which further alienated the more conservative nobles, and added to the ranks of the émigrés. On July 14, 1790, and for several days following, crowds in the Champ de Mars celebrated the anniversary of the fall of the Bastille; Talleyrand performed a mass; participants swore an oath of "fidelity to the nation, the law, and the king"; and the King and the royal family actively participated. The electors had originally chosen the members of the Estates-General to serve for a single year. However, by the time of the Tennis Court Oath, the communes had bound themselves to meet continuously until France had a constitution. Right-wing elements now argued for a new election, but Mirabeau carried the day, asserting that the status of the assembly had fundamentally changed, and that no new election should take place before completing the constitution. In late 1790, several small counter-revolutionary uprisings broke out and efforts took place to turn all or part of the army against the Revolution. These uniformly failed. This period saw the rise of the political "clubs" in French politics, foremost among these the Jacobin Club: according to the Encyclopædia Britannica, 1911 ed., one hundred and fifty-two clubs had affiliated with the Jacobins by August 10, 1790. As the Jacobins became more of a broad popular organization, some of its founders abandoned it to form the Club of '89. Royalists established first the short-lived Club des Impartiaux and later the Club Monarchique. The latter attempted unsuccessfully to curry public favor by distributing bread. Nonetheless, they became the frequent target of protests and even riots, and the Paris municipal authorities finally closed down the Club Monarchique in January 1791. Amidst these intrigues, the Assembly continued to work on developing a constitution. A new judicial organization made all magistracies temporary and independent of the throne. The legislators abolished hereditary offices, except for the monarchy itself. Jury trials started for criminal cases. The King would have the unique power to propose war, with the legislature then deciding whether to declare war. The Assembly abolished all internal trade barriers and suppressed guilds, masterships, and workers' organizations: any individual gained the right to practice a trade through the purchase of a license; strikes became illegal. In the winter of 1791, the Assembly considered, for the first time, legislation against the émigrés. The debate pitted the safety of the State against the liberty of individuals to leave. Mirabeau carried the day against the measure. Louis XVI, opposed to the course of the Revolution, but rejecting the potentially treacherous aid of the other monarchs of Europe, cast his lot with General Bouillé, who condemned both the emigration and the assembly, and promised him refuge and support in his camp at Montmédy. On the night of June 20, 1791 the royal family fled the Tuileries wearing the clothes of servants, while their servants dressed as nobles. However, the next day the King was recognized and arrested at Varennes (in the Meuse département) late on June 21. He and his family were paraded back to Paris under guard, in the same disguisement they wore in their escape. Pétion, Latour-Maubourg, and Antoine Pierre Joseph Marie Barnave, representing the Assembly, met the royal family at Épernay and returned with them. From this time, Barnave became a counselor and supporter of the royal family. When they reached Paris, the crowd remained silent. The Assembly provisionally suspended the King. He and Queen Marie Antoinette remained held under guard. With most of the Assembly still favoring a constitutional monarchy rather than a republic, the various groupings reached a compromise which left Louis XVI little more than a figurehead: he had perforce to swear an oath to the constitution, and a decree declared that retracting the oath, heading an army for the purpose of making war upon the nation, or permitting anyone to do so in his name would amount to de facto abdication. Jacques Pierre Brissot drafted a petition, insisting that in the eyes of the nation Louis XVI was deposed since his flight. An immense crowd gathered in the Champ de Mars to sign the petition. Georges Danton and Camille Desmoulins gave fiery speeches. The Assembly called for the municipal authorities to "preserve public order." The National Guard under Lafayette's command confronted the crowd. The soldiers first responded to a barrage of stones by firing in the air; the crowd did not back down, and Lafayette ordered his men to fire into the crowd, resulting in the killing of as many as 50 people. In the wake of this massacre the authorities closed many of the patriotic clubs, as well as radical newspapers such as Jean-Paul Marat's L'Ami du Peuple. Danton fled to England; Desmoulins and Marat went into hiding. Meanwhile, a renewed threat from abroad arose: Leopold II, Holy Roman Emperor, Frederick William II of Prussia, and the King's brother Charles-Philippe, comte d'Artois issued the Declaration of Pilnitz which considered the cause of Louis XVI as their own, demanded his total liberty and the dissolution of the Assembly, and promised an invasion of France on his behalf if the revolutionary authorities refused its conditions. If anything, the declaration further imperiled Louis. The French people expressed no respect for the dictates of foreign monarchs, and the threat of force merely resulted in the militarization of the frontiers. Even before his "Flight to Varennes," the Assembly members had determined to debar themselves from the legislature that would succeed them, the Legislative Assembly. They now gathered the various constitutional laws they had passed into a single constitution, showed remarkable fortitude in choosing not to use this as an occasion for major revisions, and submitted it to the recently restored Louis XVI, who accepted it, writing "I engage to maintain it at home, to defend it from all attacks from abroad, and to cause its execution by all the means it places at my disposal." The King addressed the Assembly and received enthusiastic applause from members and spectators. The Assembly set the end of its term for September 29, 1791. If the post American Revolutionary War Constitutional Convention was a success, the French Constitutional Assembly was, by comparison, a failure. The former produced an enduring document, the latter could not do so. There was not enough of a shared vision of how the "new society" should be governed. The "old regime" had been deposed but those who rebelled had not considered what they were going to replace it with. Under the Constitution of 1791, France would function as a constitutional monarchy. The King had to share power with the elected Legislative Assembly, but he still retained his royal veto and the ability to select ministers. The Legislative Assembly first met on October 1, 1791, and degenerated into chaos less than a year later. In the words of the 1911 Encyclopædia Britannica: "In the attempt to govern, the Assembly failed altogether. It left behind an empty treasury, an undisciplined army and navy, and a people debauched by safe and successful riot." The Legislative Assembly consisted of about 165 Feuillants (constitutional monarchists) on the right, about 330 Girondists (liberal republicans) and Jacobins (radical revolutionaries) on the left, and about 250 deputies unaffiliated with either faction. Early on, the King vetoed legislation that threatened the émigrés with death and that decreed that every non-juring clergyman must take within eight days the civic oath mandated by the Civil Constitution of the Clergy. Over the course of a year, disagreements like this would lead to a constitutional crisis, leading the Revolution to higher levels. The politics of the period inevitably drove France towards war with Austria and its allies. The King, the Feuillants and the Girondins specifically wanted to wage war. The King (and many Feuillants with him) expected war would increase his personal popularity; he also foresaw an opportunity to exploit any defeat: either result would make him stronger. The Girondins wanted to export the Revolution throughout Europe and, by extension, to defend the Revolution within France. Only some of the radical Jacobins opposed war, preferring to consolidate and expand the Revolution at home. The Austrian emperor Leopold II, brother of Marie Antoinette, may have wished to avoid war, but he died on March 1, 1792. France declared war on Austria (April 20, 1792) and Prussia joined on the Austrian side a few weeks later. The invading Prussian army faced little resistance until checked at the Battle of Valmy (September 20, 1792), and forced to withdraw. However, by this time, France stood in turmoil and the monarchy had effectively become a thing of the past. On the night of August 10, 1792, insurgents, supported by a new revolutionary Paris Commune, assailed the Tuileries. The King and queen ended up prisoners and a rump session of the Legislative Assembly suspended the monarchy: little more than a third of the deputies were present, almost all of them Jacobins. What remained of a national government depended on the support of the insurrectionary Commune. When the Commune sent gangs into the prisons to try arbitrarily to butcher 1400 victims, and addressed a circular letter to the other cities of France inviting them to follow this example, the Assembly could offer only feeble resistance. This situation persisted until the Convention, charged with writing a new constitution, met on September 20, 1792 and became the new de facto government of France. The next day it abolished the monarchy and declared a republic. This date was later retroactively adopted as the beginning of Year One of the French Revolutionary Calendar. In the Brunswick Manifesto, the Imperial and Prussian armies threatened retaliation on the French population should it resist their advance or the reinstatement of the monarchy. As a consequence, King Louis was seen as conspiring with the enemies of France. January 17, 1793 saw King Louis XVI condemned to death for "conspiracy against the public liberty and the general safety" by a weak majority in Convention. The January 21 execution led to more wars with other European countries. Louis' Austrian-born queen, Marie Antoinette, would follow him to the guillotine on October 16. When war went badly, prices rose and the sans-culottes (poor laborers and radical Jacobins) rioted; counter-revolutionary activities began in some regions. This encouraged the Jacobins to seize power through a parliamentary coup, backed up by force effected by mobilising public support against the Girondist faction, and by utilising the mob power of the Parisian sans-culottes. An alliance of Jacobin and sans-culottes elements thus became the effective centre of the new government. Policy became considerably more radical. The Committee of Public Safety came under the control of Maximilien Robespierre, a lawyer, and the Jacobins unleashed the Reign of Terror (1793-1794). At least 18,000 people met their deaths under the guillotine or otherwise, after accusations of counter-revolutionary activities. The slightest hint of counter-revolutionary thoughts or activities (or, as in the case of Jacques Hébert, revolutionary zeal exceeding that of those in power) could place one under suspicion, and the trials did not proceed scrupulously. On June 2, Paris sections — encouraged by the enragés ("enraged ones") Jacques Roux and Jacques Hébert — took over the Convention, calling for administrative and political purges, a low fixed price for bread, and a limitation of the electoral franchise to "sans-culottes" alone. With the backing of the National Guard, they managed to convince the Convention to arrest 31 Girondin leaders, including Jacques Pierre Brissot. Following these arrests, the Jacobins gained control of the Committee of Public Safety on June 10, installing the revolutionary dictatorship. On 13 July, the assassination of Jean-Paul Marat—a Jacobin leader and journalist known for his bloodthirsty rhetoric—by Charlotte Corday, a Girondin, resulted in further increase of Jacobin political influence. Georges Danton, the leader of the August 1792 uprising against the King, having the image of a man who enjoyed luxuries, was removed from the Committee and on July 27, Robespierre, "the Incorruptible," made his entrance, quickly becoming the most influential member of the Committee as it moved to take radical measures against the Revolution's domestic and foreign enemies. Meanwhile, on June 24, the Convention adopted the first republican constitution of France, variously referred to as the French Constitution of 1793 or "Constitution of the Year I." It was ratified by public referendum, but never applied, because normal legal processes were suspended before it could take effect. Facing local revolts and foreign invasions in both the East and West of the country, the most urgent government business was the war. On August 17, the Convention voted for general conscription, the levée en masse, which mobilized all citizens to serve as soldiers or suppliers in the war effort. On September 5, the Convention, pressured by the people of Paris, institutionalized The Terror: systematic and lethal repression of perceived enemies within the country. The result was a policy through which the state used violent repression to crush resistance to the government. Under control of the effectively dictatorial Committee, the Convention quickly enacted more legislation. On 9 September, the Convention established sans-culottes paramilitary forces, the revolutionary armies, to force farmers to surrender grain demanded by the government. On September 17, the Law of Suspects was passed, which authorized the charging of counter-revolutionaries with vaguely defined crimes against liberty. On September 29, the Convention extended price-fixing from grain and bread to other essential goods, and also fixed wages. 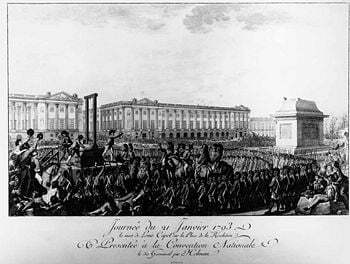 The guillotine became the symbol of a string of executions: Louis XVI had already been guillotined before the start of the terror; Queen Marie Antoinette, the Girondins, Philippe Égalité (despite his vote for the death of the King), Madame Roland and many others lost their lives under its blade. The Revolutionary Tribunal summarily condemned thousands of people to death by the guillotine, while mobs beat other victims to death. Sometimes people died for their political opinions or actions, but many for little reason beyond mere suspicion, or because some others had a stake in getting rid of them. Most of the victims received an unceremonious trip to the guillotine in an open wooden cart (the tumbrel). Loaded onto these carts, the victims would proceed through throngs of jeering men and women. Another anti-clerical uprising was made possible by the installment of the Revolutionary Calendar on October 24. Against Robespierre's concepts of Deism and Virtue, Hébert's (and Chaumette's) atheist movement initiated a religious campaign in order to dechristianize society. The climax was reached with the celebration of the Goddess "Reason" in Notre Dame Cathedral on November 10. Because dissent was now regarded as counterrevolutionary, extremist enragés such as Hébert and moderate Montagnard indulgents such as Danton were guillotined in the spring of 1794. On June 7 Robespierre, who had previously condemned the Cult of Reason, advocated a new state religion and recommended that the Convention acknowledge the existence of God. On the next day, the worship of the deistic Supreme Being was inaugurated as an official aspect of the Revolution. Compared with Hébert's popular festivals, this austere new religion of Virtue was received with signs of hostility by an amazed Parisian public. In 1794, Robespierre had ultra-radicals and moderate Jacobins executed; in consequence, however, his own popular support eroded markedly. On July 27, 1794, the Thermidorian Reaction led to the arrest and execution of Robespierre and Saint-Just. The new government was predominantly made up of Girondists who had survived the Terror, and after taking power, they took revenge as well by persecuting even those Jacobins who had helped to overthrow Robespierre, banning the Jacobin Club, and executing many of its former members in what was known as the White Terror. The Convention approved the new "Constitution of the Year III" on August 17, 1795; a plebiscite ratified it in September; and it took effect on September 26, 1795. The new constitution created the Directoire (English: Directory) and created the first bicameral legislature in French history. The parliament consisted of 500 representatives — le Conseil des Cinq-Cents (the Council of the Five Hundred) — and 250 senators — le Conseil des Anciens (the Council of Elders). Executive power went to five "directors," named annually by the Conseil des Anciens from a list submitted by the le Conseil des Cinq-Cents. With the establishment of the Directory, the Revolution might seem closed. The nation desired rest and the healing of its many wounds. Those who wished to restore Louis XVIII and the Ancien Régime and those who would have renewed the Reign of Terror were insignificant in number. The possibility of foreign interference had vanished with the failure of the First Coalition. Nevertheless, the four years of the Directory were a time of arbitrary government and chronic disquiet. The late atrocities had made confidence or goodwill between parties impossible. The same instinct of self-preservation which had led the members of the Convention to claim so large a part in the new legislature and the whole of the Directory impelled them to keep their predominance. As the majority of French people wanted to be rid of them, they could achieve their purpose only by extraordinary means. They habitually disregarded the terms of the constitution, and, when the elections went against them, appealed to the sword. They resolved to prolong the war as the best expedient for prolonging their power. They were thus driven to rely upon the armies, which also desired war and were becoming less and less civic in temper. Other reasons influenced them in this direction. State finances had been so thoroughly ruined that the government could not have met its expenses without the plunder and the tribute of foreign countries. If peace were made, the armies would return home and the directors would have to face the exasperation of the rank-and-file who had lost their livelihood, as well as the ambition of generals who could, in a moment, brush them aside. Barras and Rewbell were notoriously corrupt themselves and screened corruption in others. The patronage of the directors was ill-bestowed, and the general maladministration heightened their unpopularity. The constitutional party in the legislature desired a toleration of the nonjuring clergy, the repeal of the laws against the relatives of the émigrés, and some merciful discrimination toward the émigrés themselves. The directors baffled all such endeavors. On the other hand, the socialist conspiracy of Babeuf was easily quelled. Little was done to improve the finances, and the assignats continued to fall in value. The new régime met with opposition from remaining Jacobins and the royalists. The army suppressed riots and counter-revolutionary activities. In this way the army and its successful general, Napoleon Bonaparte eventually gained much power. On November 9, 1799 (18 Brumaire of the Year VIII) Bonaparte staged the coup of 18 Brumaire which installed the Consulate; this effectively led to his dictatorship and eventually (in 1804) to his proclamation as Empereur (emperor), which brought to a close the specifically republican phase of the French Revolution. The constitutional assembly failed for many reasons: there were too many monarchists to have a republic and too many republicans to have a monarch; too many people opposed the King (especially after the flight to Varennes), which meant that the people who supported the King had their reputation slashed. Despite the fact that post-Revolutionary France had its share of Emperors and Kings, perhaps the strongest notion that emerged from the Revolution was the concept of being a citizen. The Revolution is also credited with introducing the notion of nationalism into political discourse – the idea that the nation belongs to its people. The French Revolution made a lasting and mixed impact on France and the world. The most significant innovation was ideological, making abstract rational principles the ground for revolution and radical social change. This created instability as every new group of revolutionaries could claim it had as much right to impose its ideals as the group before. France has had about 11 constitutions since 1789. Respect for tradition, liberty and the achievements of previous generations was replaced by a "cult of change," progress and modernity. This outlook has has been adopted up by revolutionaries around the world often with very destructive consequences for life, culture, social institutions and cultural artifacts. The Revolution was popular because people wanted freedom, but the result was a powerful State which was far more coercive and interfering than the old monarchy. Today the Revolution is an issue that still divides France with some defending it and others criticizing it. Around the world its interpretation is also contested as the extensive historiography shows. Conservatives such as Edmund Burke accepted that reform was necessary but regarded revolution as a mistake from which the Terror and dictatorship inevitably followed. The liberal approach to the Revolution such as that of Alexis de Tocqueville has typically been to support the achievements of the constitutional monarchy of the National Assembly but to disown the later actions of radical violence like the invasion of the Tuilieres and the Terror. Socialists and Marxists such as Louis Blanc defend the revolution as an inevitable and progressive event. When China's Premier, Chou En Lai was asked in 1972 whether he thought the French Revolution had been a good or a bad thing. He mused for a few moments and then replied "It's too early to tell." End of Absolute Monarchy: The French Revolution dealt a death-blow to absolute monarchies all over Europe. Even though the monarchy was restored for a period in France, from that point on there was constant pressure on European monarchs to make concessions to some form of constitutional monarchy that limited their powers. The ones that did not respond were all overthrown. Professor Lynn Hunt of UCLA, regarded the creation of a new democratic political culture from scratch as the Revolution's greatest achievement. At the same time she also interpreted the political Revolution as an enormous dysfunctional family haunted by patricide: Louis as father, Marie-Antoinette as mother, and the revolutionaries as an unruly mob of brothers. Demise of the Feudal System: The Revolution held up equality as an ideal for all the citizens of France and forcibly eliminated the traditional rights and privileges of the aristocratic class. Some revisionist historians such as Alfred Cobban have recently argued that feudalism had long since disappeared in France; that the Revolution did not transform French society, and that it was principally a political revolution and not a social one as socialists had previously believed. Rights: The Revolution made a significant contribution to the theory of human rights even if there were gross violations in the first few years of the Revolution. The language of abstract rights that has come to dominate current political discourse has its roots in the French Revolution. These are not discrete clearly described rights that are circumscribed by law and custom but abstractions bestowed by the State which may undercut tradition, custom, law and traditional liberties. Modernization: The French Revolution originated the idea that ancien regimes should be "modernized" according to the principles of a rational state. Modernization extended to the military, the administrative system, and other aspects of French life, with effective results. The very idea of modernity can be traced to the revolution. Administrative and judicial reforms: These survive to this day as a positive legacy for France, having made the country's polity more rational and fair for all its citizens. The greater freedom and equality made society more meritocratic. The Civil Code remains the basis of French law and has influenced other European legal systems. Decimal and metric systems were first introduced in 1795 and have been adopted by much of the world. Freedom of religion particularly for Protestants and Jews. Wherever Napoleon's armies went, Jews were emancipated and given the opportunity to participate as equals in European society. Disestablishment of the Church Education and social welfare programs that had traditionally been provided by the Catholic Church declined dramatically with the Revolution's attack on the church. The state was unable to provide alternative provision for many decades. The revolution destroyed the "religious, cultural and moral underpinnings of the communities" in which ordinary French people lived. Violence The Revolution's anticlericalism led to the repudiation of Christian virtues and sentiments. The revolution injected hate into the political process. The violence that characterized the revolution was a response to the resistance it encountered. It was naive to expect the nobility to welcome the abolition of their ancient status and privileges especially as the reforms were enforced hastily, without negotiation or compensation. This use of violence and terror has been adopted by revolutionaries around the world who regard it as legitimate and unavoidable. War The Revolutionary Wars and Napoleonic Wars convulsed and changed the map and future of Europe. The character of war itself was changed. France mobilized all its resources to fight the wars and other countries had to do the same to defend themselves and defeat France. This required a huge rise in taxation and expansion of the power of the state. The wars had a world wide impact drawing in the colonies of both sides. These wars were also ideological and thus a precursor of the world wars of the next century. Nationalism French revolutionary principles were exported and imposed on much of Europe. It led to the rise of nationalism as one of the key principles of the revolution was that people should think of themselves as citizens and have as their highest and sole source of identity the nation state. This fostered national hatred and conflict. Germany for example was 'tidied up'. Napoleon abolished the Holy Roman Empire and reduced the 396 principalities and free cities to 40. This imposition French rationalism and culture stirred up a reaction which poisoned Europe in the following century. The counter-Enlightenment with its rejection of abstract rationalism and emphasis on romanticism and blood ties blossomed in Germany, leading to a wounded German nationalism. Bismarck completed the unification so as to prevent the French, or anyone else, trampling over and humiliating Germany again. Revolution Revolutionaries for the past 200 years have regarded the French Revolution as a model to be emulated. Ever since there have been revolutionary figures hanging around plotting and waiting for the opportunity to seize power. These rebellions are against the supposed violation of abstract rights rather than existing laws. The revolution was a source of inspiration to radicals all over the world who wanted to destroy the ancien regimes in their countries. Some officers of the Russian Army that occupied Paris took home with them revolutionary ideas which fermented and directly contributed to the ideological background of the Russian Revolution. Historian François Furet in his work, Le Passe d'une illusion (1995) (The Passing of An Illusion (1999) in English translation) explores in detail the similarities between the French Revolution and the Russian Revolution of 1917 more than a century later, arguing that the former was taken as a model by Russian revolutionaries. Secularization The anti-clericalism and de-Christianization policies created a deep and lasting gulf in France pitting the two sides against each other. This had a social and political expression too. Socialists and trade unionists throughout continental Europe have tended to be atheists. The strict separation of church and state took traditional Christian values out of public life. Citizenship is still the only sort of identity recognized by the French State which has made it harder for France to integrate religious minorities such as Muslims who find their identity elsewhere. Democracy The revolution was carried out in the name of democracy and has spread the message to the world that the people are, or ought to be, sovereign. The French version of democracy has had a tendency to become intolerant of dissent and totalitarian. The modern democratic terminology of left-wing and right-wing comes from the seating arrangements of two main groupings in the Constituent Assembly. ↑ A recent study of El Niño patterns suggests that the poor crop yields of 1788–1789 in Europe resulted from an unusually strong El Niño effect between 1789 and 1793. Richard H. Grove, “Global Impact of the 1789–93 El Niño,” Nature 393 (1998): 318–319. ↑ M. Walzer, "Citizenship," in T. Ball & J. Farr & R. Hanson, (eds.) Political Innovation and Conceptual Change (Cambridge: Cambridge Univ. Press, 1989). ↑ John Hall Stewart, A Documentary Survey of the French Revolution (New York: Macmillan, 1951), 86. ↑ Christopher Hibbert, The Days of the French Revolution (New York: Morrow Quill Paperbacks, 1981), 93. ↑ William H. Sewell, Review of Politics, Culture, and Class in the French Revolution by Lynn Hunt. In Theory and Society 15 (6) (Nov 1986): 915-917. ↑ Jeff Goodwin, Review of The Family Romance of the French Revolution by Lynn Hunt. In Contemporary Sociology 23 (1) (Jan 1994): 71-72; quote from Madelyn Gutwirth. "Sacred Father; Profane Sons: Lynn Hunt's French Revolution." French Historical Studies 19 (2) (Autumn 1995): 261-276. ↑ Alfred Cobban, The Social Interpretation of the French Revolution (Cambridge, 1963, ISBN 0521667674). ↑ William Doyle, The Oxford History of the French Revolution (Oxford: Clarendon Press, 1989). Ball, Terence, James Farr, and Russell L. Hanson (eds.). Political Innovation and Conceptual Change. Cambridge University Press, 1989. ISBN 978-0521359788. Cobban, Alfred. 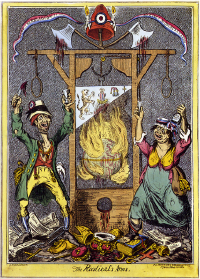 The Social Interpretation of the French Revolution. Cambridge, 1963. ISBN 0521667674. Sobel, Robert. The French Revolution. Peter Smith, 1973. ISBN 978-0844609225. This page was last modified on 11 May 2017, at 14:42.